I want to tell you about Groningen, in the Netherlands, but this is not a travelogue. Bill and I didn’t come here as tourists, but to be with our friends. I want to write about how a place can hold you, in both senses of that word. But first I’ll describe this small city. The old town is surrounded by a canal, and it is self- contained and self-providing - no need to drive elsewhere for what you need. You can walk everywhere, and though cars are allowed in the city, the only traffic to worry about are streams of bicyclists.There is a central marketplace for Tuesday & Friday Market, shops, cafes, restaurants, a university, movie theater, concert hall and three museums. Groningen gifts you with a lovingly cared for aesthetic. It is charming and accessible - we circumnavigated in 45 minutes - and there are beautiful old sailing barges docked along the canal. Nights are softly lit, and light sparkles the dark water of the canal. But I have been in charming places that did not create the sense of well-being that we experienced. I think that comfort comes from an integration of mind/ heart/ body that I usually only experience in nature, not in cities, and I think there are several reasons for this. The first involves the proportions of this small city, and the harmony of the architecture. 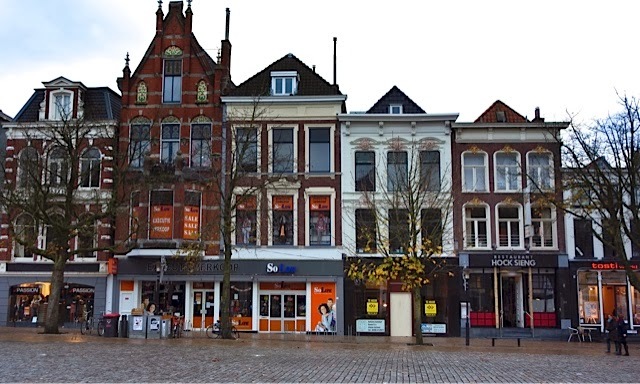 The buildings are on a human scale - most are no more than 5 stories, and most are in the style of Dutch architecture of the 17th century.The harmony of the buildings comes from their related styles. Another source of well-being is the relative quiet. No rush of traffic, trucks honking, jackhammers yammering - an absence of noise pollution. 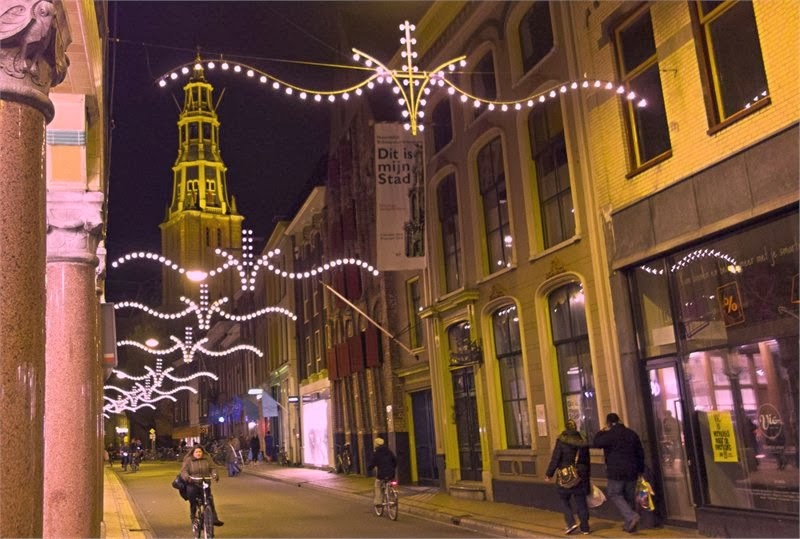 The sound of church bells is as natural to this town as birdsong in a forest, and the Dutch do not walk down the street yelling into their cellphones. And there is what happens to your body, to your psyche when there is no possible threat. Our first night we left our friend’s house at 11. At first I was anxious, as I am here at home, walking on dark streets at night - then I realized we were perfectly safe. We walked slowly back to our apartment through narrow streets and unlighted alleyways, free to enjoy the moon, the shadows dancing on the water, and the holiday lights. The lighted church towers become landmarks, so you always know where you are. No gun-waving or knife-brandishing mugger would appear as they have twice in my own city. When you can relax, without having to be vigilant or on guard, you can be open, and of course when you are open you can be more loving and caring and creative, as we discover again and again. Groningen is a soulful city. 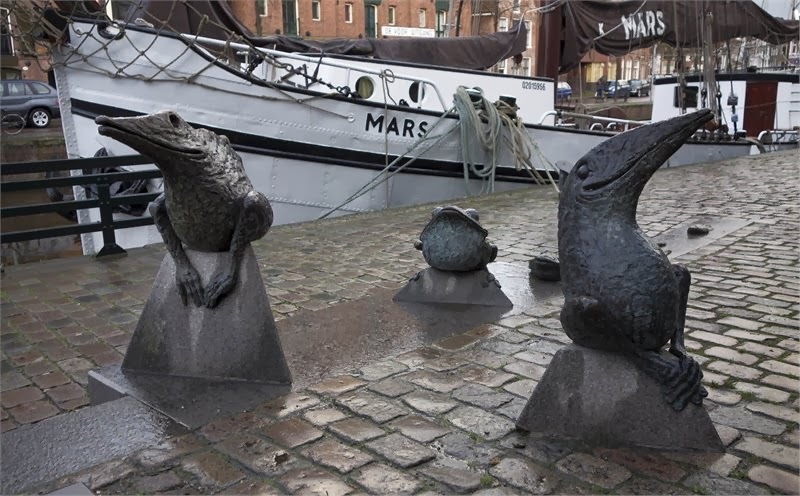 It's as though the river spirits and the spirits of all the shipbuilders, the captains and sailors who navigated the canals and rivers to the sea watch over it. Now I know who you are, dear readers. You do not need a long lecture on the contrasts between what I have described and life in American cities, or the statistics on what stress and a lack of a feeling of well-being do to us - and how much we spend on things and therapies to make it go away. During my college years, I participated in a work camp at nearby Hoogezand where we restored a ship to be used as a school for the children of shippers. I liked the area, and that includes Gronigen. Nice to hear the place is still a nice destination. Malcolm, delighted to hear from you. I loved the ships - went to the shipmuseum twice. What a wonderful job you had!